Pours a light amber color with an average frothy white head with good retention. Settled color is a pale yellow color. Excellent lacing with full coverage around the glass. Body is still with mostly brilliant clarity, slight haze. Initially a strong perfumey hop presence escapes from the glass. The hops dominate the aroma, over powering the malt presence. After the perfume hops settle, a nice citrus hop aroma takes over - delicious. Initial taste is a delicious blend of flowery hops and sweet malts, becoming mostly bitter at the finish despite some lingering malt mouthfeel. With active carbonation and a medium body, the creamy texture flows down smoothly. The hop bitterness creates a harsh drying presence on our palates. A soft alcohol warming presence was noticable, leaving our mouths feeling the sting. It's Hop - Stupid. 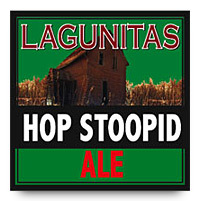 Don't be Stupid - the hops are large and in charge. If you don't like IPA's - stay away. If you are afraid of hops - put this back on the shelf. Hop Addicts Welcome - All Others Beware! !